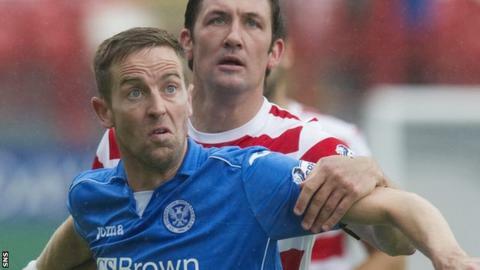 St Johnstone manager Tommy Wright has expressed his sympathy for injured striker Steven MacLean and backed him to bounce back again. The 32-year-old had a clean-up operation on his knee, but surgeons found the damage was worse than was first thought. MacLean, injured for much of last term, could miss six months of this season. "He is a strong character and will get our full support to make sure he makes a full recovery," said Wright. "It's a tough one for him. I have had injuries myself, so I know what he is going through." MacLean was missing for four months of last season but has scored three times in seven games this term. Defender Tam Scobbie is also set for an operation on Monday on a knee injury of his own, with a lay-off of three months expected. "It hasn't been a good week for us in terms of injury news," said Wright. "Tam got a knock on Monday and is now looking at around three months out, while Steven has had his op, which we thought would just be a clean-up but actually needed a microfracture to give him the best chance of recovery. "It's not in the same area as his previous injury, but we are still looking at around four months before we get him back. "The worst-case scenario would be six months." Wright recalled his own two-and-a-half years on the sidelines as a player. "It is horrible to go through," said the St Johnstone manager. "I went in for a clean-up in my knee but had some really bad rehab after the medical person in charge made a mistake and I ended up with a hole in my knee. "I had to have a similar operation to the one Maccer has just had, but they couldn't diagnose the problem, so I ended up [having] three ops. I never really got out of rehab that whole time. "That was probably the lowest point of my career. There was times when I would go to watch games and I didn't want to be there. I felt embarrassed taking a wage. "I got back playing, though, because I had the support of a great club and a great manager in Frank Clark." Wright is confident that MacLean will cope in the face of adversity. "The mental side of it won't be a problem for Steven," added the manager. "He's a highly-motivated person and even last year, when he was out, he was still lively about the changing-room."